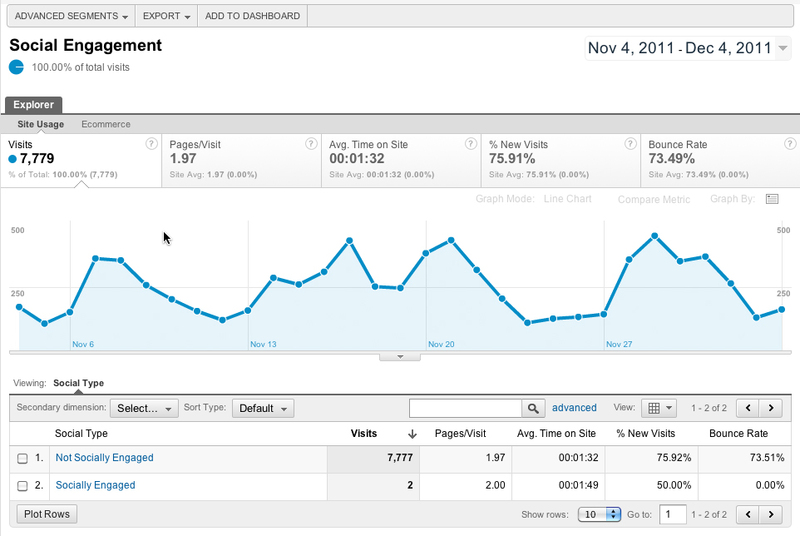 Google Analytics now provides a set of reports for tracking social interaction with a website’s content. This new metric will measure how often users use social share buttons – for example, a Facebook Like, and Google +1, a LinkedIn share, or a tweet. This information can be used to analyze how your users share information and whether your sharing audiences use your website in different ways than those who do not. 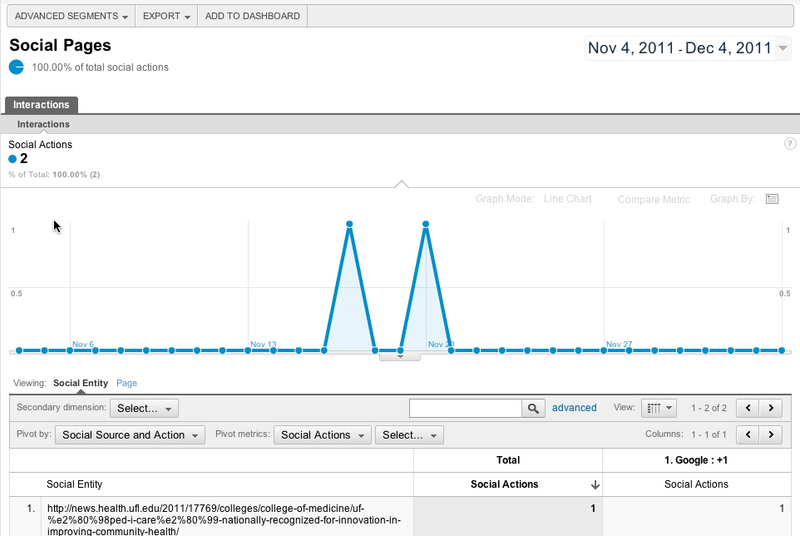 The Social Engagement Report shows site behavior changes for visits that include clicks on any social sharing actions. In the example below, we see that of 7,777 visits to this website in the last 30 days, only two visitors were socially engaged. In the example above, we should also note that this site is only pulling in data from Google+, which is built in to the Google Analytics application. In order to measure engagement from other social media networks, it’s necessary to modify the scripts that control each of the social media engagement tools, which we’ll discuss in a moment. The Social Actions report displays the number of social actions (+1 clicks, Tweets, Facebook Likes, etc) that have taken place on the site. This information can be important to determine which networks are more preferred by users, which can lead to making that button larger, changing its position on the screen, etc. 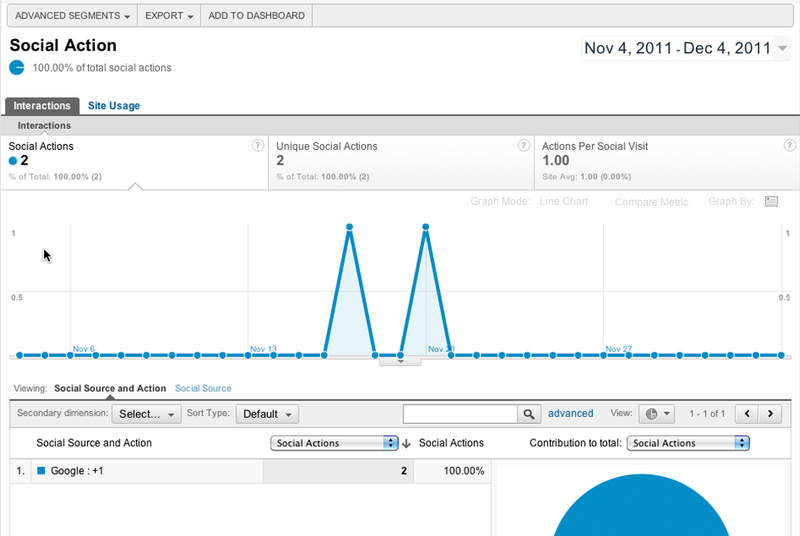 The Social Pages report shows the specific pages on your site that are driving social actions. This is very useful for content providers to determine what content on their site is of most interest to your audience, what they are most likely to share with their friends, and what has the greatest potential to become viral content. In order to track the other social media tools, Google has created Social Interaction Tracking. This tracking has to be integrated into each social network button. 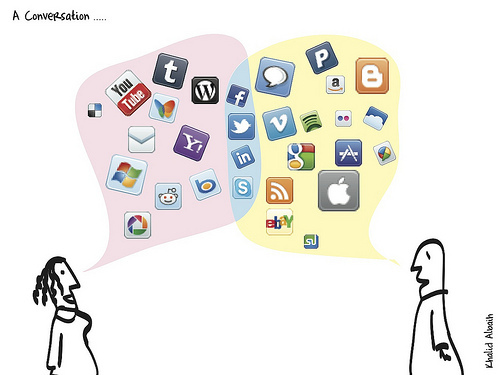 Name of the social network: Google, Facebook, Twitter, Digg, etc. Type of action: Like, Tweet, Send, Stumble, etc. This optional field allows the user to manually set the Subject of the action being taken. If it is not used, this defaults to the URL of the web page being shared. If used, it can be used to name a different web address, the name of a product or an article, or the content ID of the material, for example. This optional field can be used to change the URL where the sharing took place (for example, for listing a virtual page name instead). For a more technical overview on how to implement this tag for Facebook and Twitter visit the code site article. Google Analytics and Social Interaction Part 2: In the next installment of this post, we’ll discuss methods for tracking incoming links from social networks and recording these in Google Analytics.